Another game to satisfy the gaming hunger of Blackberry users. Bomberman Vs Zombie is quite a fancy name for a Blackberry device, but it really is interesting and amazing in its own right! 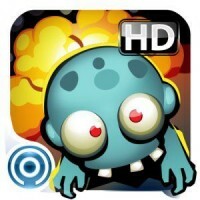 Bomberman Vs Zombies was developed by Contlex Labs LLP and they have really done a great job to say the least. The developer has created a number of titles for the Blackberry and Android devices and it comes as no surprise why they are popular among its users. The game mixes up the concept of the classic Bomberman game with some evil-dead thrown in for fun. In game you will be assigned 5 lives and a mission to to clear all of the Zombies in order to open the door to the next level. The user-interface of the game is simply amazing and really does a neat job to help players get around settings and options really quick. The game includes the deadly creatures with several different characteristics, they being, slow zombies, fast zombies and zombies that can teleport themselves. It further includes a healthy amount of bonuses, which can be used by players for their own advantage in-game. Also, to break the monotony, players have the options to use different kind of bombs. Overall, the game is great and quite easy-to-play and provides hours of fun for players who are heavily into casual gaming. The game is also available on Android.